Located on the border of Kent and Renton, across the street from IKEA. 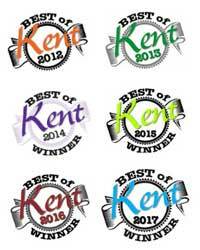 Best of Kent 6 Years in a Row! 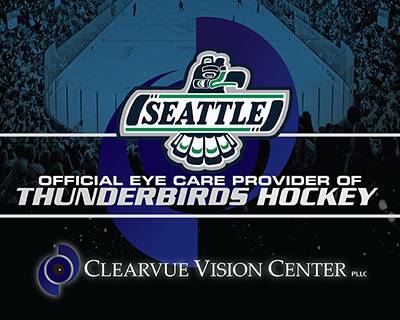 We are proud to be the Official Eyecare Provider of the Seattle Thunderbirds Hockey Team! "I am a new patient to Clearvue. The team at the front desk were very friendly and helpful. I felt that my optometrist was knowledgeable and attentive. I also love that they send text alert reminders for appointments that is super helpful. I did feel that wait time was a little long once I was brought back to the room, but the office seemed busy during my appointment time. Overall very pleased with my experience at Clearvue." "Extremely personalized, thorough, and friendly staff who all go above and beyond to ensure quality eye care, comfort and service along with all follow yo aid along with way . They also spell out what to expect during and after appointment with eye sight bid recommend the, to everyone who needs eye care." "This place always does such a great job! I love Dr. Moy! She is so precessional and kind and awesome. Rachael is fantastic and knowledgable and Lisa is so hilarious and can make anyone feel comfortable! Always great service and great product, plus the front desk ladies are SO kind! If you have any questions, they’re always happy to help! Especially Bonnie! Keep up the great work, ladies!" "I am having cataract surgery and after my initial consultation at the surgeon’s office discovered I had to leave my hard lenses and go to soft lenses immediately or my surgery would be delayed. I stopped by Clearvue and they were able to get me in right away. They were kind and considerate, eliminating a need for delay. I do appreciate everyone who helped make this happen. This is representative of the care I have always received from them. Thank you all!" "Everyone is nice, and friendly here. Very knowledgeable and respectful." "I care a lot about my eye health and I really trust Clearvue. They seem to use the most recent technology and tests to get the best picture of your eye health. The staff is friendly and caring and takes the time to listen to your concerns. And they support the local team, the Thunderbirds!" "The entire staff is wonderful. Everyone is very friendly and accommodating. They have a nice selection of frames as well. This is, by far, the best place in Kent." "Excellent service, fast friendly and everyone was really helpful." "I have an eye condition. I'm always skeptical about new optometrist because not many don't know much about it. Dr. Moy very knowledgeable, so takes her time to make sure I have the prescription. So far no problems with my new contacts." "The office manager handled an issue I had absolutely amazingly made me feel like they truly value me as a patient thank you." "I’ve been a patient of Clearvue Vision since it first opened and have always been highly satisfied with the care I get from everyone from the front desk to Dr Gelt and in between. I would highly recommend them to anyone looking for an eye doctor." "Very pleasant and friendly staff. Very kind and helpful." "I had a great experience at Clearvue Vision Center. From the moment I got there I was greeted and felt welcomed. Dr. Moy was very nice and told exactly how my eyesight was and if I needed any changes. I would recommend Clearvue to other people." "My first appointment at Clearvue was a great experience. The staff was fun and easygoing. Doctor was relatable and willing to spend extra time getting to understand my issues"
"I've been going to Clearvue Vision Center for about 3 years for my eye exams, contacts and glasses. The staff and doctors are always kind and listen to me as the patient. Last year I had an emergent eye issue and they were able to get me in right away and prescribed the right treatment. I started coming here based on a friends recommendation and I definitely recommend them to my other friends."